The right mirror: The most useful and under-appreciated decorating tool. When you're deciding whether to hang a mirror or a piece of art, the choice should always come down to the one that is most aesthetically appealing. But in many cases a mirror just works better. With a beautiful frame and decorative details, a mirror becomes art. Hung on a wall opposite a painting, it reflects the image, giving the painting even more importance. Besides being beautiful, mirrors, with their silvery coloration and reflective powers add a sense of light and space to any room. Whether they are simple and practical or ornate and decorative, mirrors allow you to see a room, rather than just your reflection, in a completely new way. They are wonderfully neutral, neither traditional nor contemporary and blend well in any interior. They are simply the most elegant, useful and under-appreciated decorating tool. Click on each photo to see the complete range of sizes available. 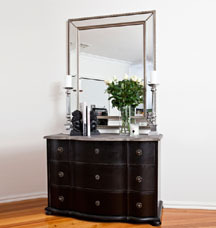 Subscribe to receive our newsletter for special prices on some of our most popular mirrors.